Our integration with Google Ads will track each call to your call-only ads and call extensions back to the exact keyword, adgroup, and campaign that led to the call. After you have completed the steps below, you will have Ads data associated with your ad extension and call-only calls. This will allow you to see the keyword data, campaign, and adgroup data for each call within CallTrackingMetrics’ call log and call reports. In CTM, assign a tracking number to the tracking source “Ad Extension”. If you are needing to track multiple extensions, then purchase multiple tracking numbers all associated to the same Ad Extension source. 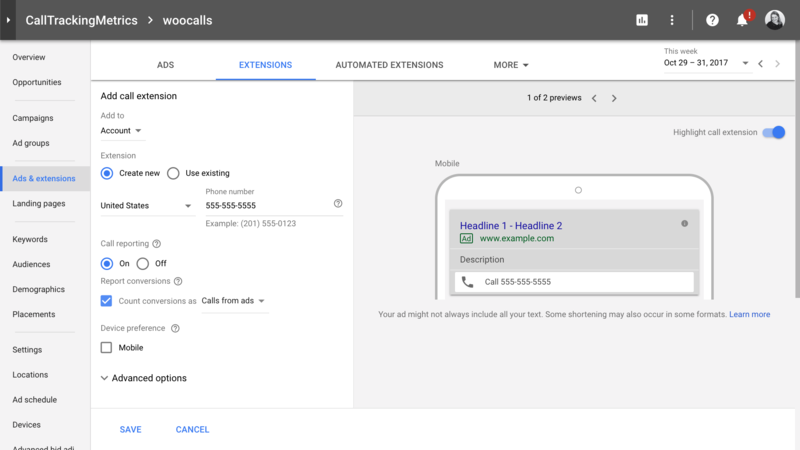 In Google Ads, add the Ad Extension tracking numbers as a call extension. Set your call extensions to use Call reporting and save. 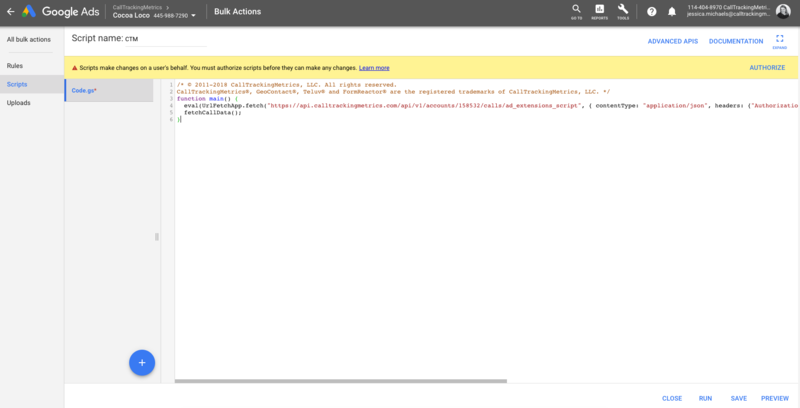 In Google Ads, navigate to Bulk Actions and select Scripts. Click the red button (“+SCRIPT”) to add a new script. Copy the script from CTM (which can be found by going to Settings → Integrations → Google Ads) into the code section in Ads. Name your script “CTM Call Reporting”. From the list of scripts, add a schedule. Set it up to run hourly. Only click-to-call dialed calls will be attributed as a call conversion in Ads. If a call extension is manually dialed, the call will not count as a conversion in AdWords, nor will the keyword data be attributed. The script is scheduled to run hourly, creating a 1-2 hour delay for the campaign information to be attributed in the call log and in CTM’s reporting. The campaign data will not be attached to the event CTM sends into Analytics. Call conversion goals must be preconfigured in Ads in order for the call to be counted as an Ads conversion.